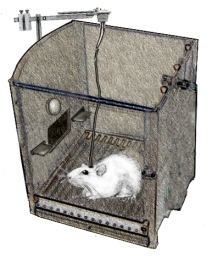 Self administration tasks usually involve operant procedures in which animals learn to lever press in order to receive electrical stimulation of a brain area involved in motivation and reinforcement (e.g., the nucleus acumbens) or for an infusion of compound (e.g., morphine, cocaine), via an intravenous catheter that has reinforcing properties. The number of times an animal will press a lever for a drug can often provide an indicator of the abuse potential of a drug. Rats will (for example) press a lever for hundreds of times in order to receive a cocaine injection. This test is useful for investigating the brain regions involved in motivation and reinforcement and for determining the abuse potential for novel drugs.